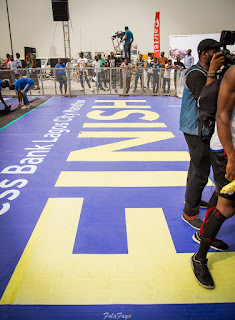 A couple of weeks ago, I had the rare privilege of covering the Lagos Marathon as a backup photographer. My wife was covering for a group and I tagged along. As usual, as I took photographs at different points, I also looked around to take in a few lessons. I have discovered that when you observe, you learn a lot. “To acquire knowledge, one must study; but to acquire wisdom, one must observe”, opined a wise man. I was able to draw some analogies between the marathon and a marriage relationship. Let me share with you some of my observations and learnings. Yes. Some people had prepared for the marathon for months, while some others had never even completed a 5km race prior to that time. They just heard about the marathon and decided to participate. The same is true in a marriage. Some people come into it well prepared, while others just stumble into it. Those who took time to prepare had a much better chance of finishing compared to those who didn’t. For example, the Kenyan who won the race in 2.16.21hrs practices every single day of the week. A colleague of mine too, who finished quite early also runs 10km almost every single morning! You don’t win or finish a marathon by accident. A lot of work and preparation goes into it. The same is true of a marriage. You are better off prepared. Of course, I know some people who finished the marathon without much preparation but it will take a lot of grit and determination – and of course, you’d be well behind others. In case you stumbled into marriage, or you were ill-prepared for it, the good news is this – you can still finish strong! You’d have a lot of learning to do, and a lot of catching up to do, but it is not a deterrent to finishing strong. As I thought more about this, I believe that our generation owes it to the next generation to help them prepare well for marriage. Most in generations before us perhaps didn’t do a very good job at this in my opinion. And we seem to be doing exactly the same too, or even worse. The best gift we can give to those after are examples of marriages that works! A great preparation for a young man for instance is to see how his father loves, respects and treats his mother. If you are reading this and you are a father, you have a lot of work to do, believe me. You had better start now. 2. Not everyone who started finished. Not everyone who thought they would finish eventually finished. Over 20,000 athletes registered for the marathon but only about 10% of them made it to the finish line. Guess what? That’s about the success rate for marriages these days – I mean the percentage of those who truly lived happily ever after – not just staying together because "of the kids”, or "what would people say?" but really fulfilled. A lot of people started the marathon with energy, excitement and high hopes. There were lots of “wishes”. But hopes and wishes don’t win marathons. I have heard stories about people going into marriage relationship with excitement and high hopes. As important as these are, you need more to succeed in marriage – a lot more. 3. It takes strength and stamina to finish a marathon. In the same way, it takes staying power to finish strong in marriage. By finishing strong, I mean that you are fulfilled, faithfully and happily married to 1 man/1 woman till death do you part. In today’s world, the chance that you would finish strong is just about 10%. There are many ambushes on the way to having a truly successful marriage. There are many odds against you. Not everyone who crossed the 10 meter mark (maybe equivalent to 10 years of marriage) made it to the end. Not everyone who reached the half way line finished. Marriage is like a marathon. You need stamina for it. You need to keep going even when you don’t feel like it – when your partner is getting under your skin and you are about to throw in the trowel; when things are not going exactly the way you had them planned; even when the “weather” is not favourable. There is something that comes with running with a group of like-minded people. It gives you an unbelievable lift. It gives you encouragement. This is the reason why the geese fly in a V formation. When they do, they conserve a lot of energy, and just ride on the “corporate” energy of the formation. This works similarly in a marathon (albeit slightly different), as well as in marriage. The group we were covering gave us a brief that they were expecting about 7 people to hit the finish line. More than double that number finished! I believe it was because they ran together. There is a way that seeing someone else you know or practice with run, that encourages you to do the same. It pushes you to do a few more kilometers. A colleague of mine ran with his wife and his wife finished before him. He told me he didn’t even consider stopping, as long as his wife was in the race! How could he? In marriage, you need positive influence also. You need to be in the company of those who are determined to finish strong. I am not talking about perfect people but people who have their eyes on the finish line. You need a lift every now and then, and “flying in formation” will help. Who are your friends? Those who beat up their wives and brag about extra marital affairs? Those who disrespect their husbands and run them down? Or those who talk about how to make things better? Whichever group you belong to, you will get a lift – wither positively or negatively. During the marathon, the organizers made provisions for water stations every 2.5km to cater for dehydration. Nutritional drink stations were also available every 5km. It was a delight to watch people arrive at these stations, and refresh. Even the most athletic would stop by to take a drink, and pour much more on his/her head. These breaks were very well needed to finish strong. In marriage, we sometimes get weary. Even the best of marriages go through their dull moments. I believe that there are also water and nutritional stations to help marriages. A seminar together. A movie night without the kids. Reading a book together. Taking a vacation together. Praying together. Talking together. Just do whatever will refresh you both, and give you the energy to go a few more kilometers. Utilize the water breaks. Don’t just run past them. As I write this, my prayer for every married person reading this, as I pray for myself, is this – May you finish strong, and leave behind the legacy of a strong finish to the coming generation! 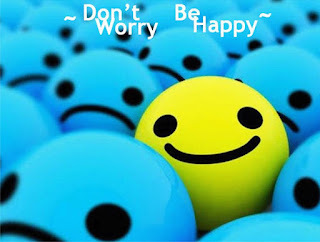 How many of you reading this thinks or feels that your life would be better if you worry a lot more? I bet none. Whether you know worry as an occasional visitor or a constant companion, whether you find it to be mildly uncomfortable or intensely painful, or whether you experience worry as a slight distraction or as a force that completely immobilizes you, we all would like to worry less (except for those only seem happy when they’re miserable), wouldn’t we? I started sharing in my last post a few thoughts on what we can do to be free from worry. I would encourage you to read it up, if you haven’t. I shared 2 thoughts in that post and will share 3 more here. One of the best cures for worry is proper planning and work. Most worriers are lazy people. Consider the story about three servants who were given trust over their master's investments. The third servant, who hid his master's investment in the ground because of all his worries, was judged not only as "wicked," but also a "lazy" servant. Planning for the future is fine. Most people worry because of lack of proper planning. A lady who is getting ready to be married but has not planned well is set to be worry ladened all through the week of her wedding. A man who has plans for his retirement will worry less than one who doesn’t. Proper planning delivers you from worry! My advice is that you live in day-tight compartment. Take one day at a time. People living through a tremendous crisis soon learn that they have only enough energy to face today. 'One day at a time' becomes their motto. Forget yesterday. Plan for tomorrow. But live today. “Yesterday is a cancelled cheque. Tomorrow is a promissory note. Today is cash!” Spend it well. Don’t let worries about tomorrow deny you the pleasures of today. Like my good friend said “ Some prepare so much for tomorrow’s rain that they forget to enjoy today’s sunshine.” Live one day at a time! It's important to develop coping strategies for worry - learning to think more realistically. Most anxiety is a distortion in the way we think. We would solve a lot of worry problems if we think more logically and creatively. Astronaut Jim Lovell was in command of the Apollo 13 spacecraft when it experienced an explosion on its way to the moon. Their oxygen was almost gone; their electrical system was out, and their spaceship was plunging toward lunar orbit. They were destined to be lost in space, thousands of miles from home. During a press conference after their safe return, Lovell was asked; 'Were you worried?' and he gave an answer that surprised almost everyone in the room. 'No, not really.' He continued, 'Worry is a useless emotion. I was too busy fixing the problem to worry about it.' Use your mind! Another idea is to limit the amount of time we allow ourselves to worry. I read about a guy who had so many things to worry about, he set aside one day each week in which to worry. As worries came to him, he wrote them down and put them in his worry box. Then, on Worry Wednesday he pulled out each worry and read it - and discovered that most of the things he was disturbed about had already settled themselves or had been taken care of in some other way. Do you remember the Bobby McFerrin song "Don't Worry, Be Happy"? When it hit the top of the charts, it was criticized as being too simplistic and naive. However, it has some very important sentiments! Don’t Worry. Be Happy! Of all the living things that God created, human beings are the only ones that worry. And we worry about everything - petrol prices, the stock market, taxes, jobs, paying the bills, marriages, relationships, parents worry about children, children worry about parents. You name it, somebody is worrying about it! If you are from this part of the world, then you even have a lot more to worry about – bad roads, electricity, safety and security. Worry seems to be legitimate around here. Near the end of his life, Mark Twain said, “I am an old man and have known a great many troubles, but most of them never happened.” Always remember that the outcome of a situation will still be the same whether you worried about it or not! Worry wastes a lot of emotional energy. Have you realized how few of the things we worry about actually happen? One survey says 40% of the things we worry about never happen; another 30% of our worries are in the past, and we can't do anything about them. 12% concern other people, and are really none of our business anyway. 10% are about sickness which we can do very little to control. Only 8% of the things we worry about are actually worth worrying about! In my opinion, even the 8% can be challenged. Listen to the advice of the creator of the world. A wise man once said “Worry is interest paid in advance on something you may never own”. How true! Worry indeed is like a rocking chair. It gets us nowhere!! Worry never climbed a hill. Worry never paid a bill. Worry never dried a tear. Worry never calmed a fear. Nothing wears faster than worry. What then can we do to be free from worry? Let me share a few thoughts with you. One man took a paper bag, wrote 'God' on it, and taped it high on the back of his kitchen door. Whenever he prayed about the things he was worried about, like his job or his family, he would write them down on a piece of paper, and put it in the bag. Then he made a rule for himself. If he started worrying about a matter that he'd turned over to God, he had to climb up on a chair and fish that paper out of the bag. He said it was pretty revealing when he saw just how much time he spent sifting through those scraps of paper. You see, we can trust God to be there, to care for us, to provide for us. That's the good news, so why worry? Can I tell you a story? I call it the story of two buckets. A traditional well always has two buckets. As one is going down, the other is on its way up. Long time ago, there lived two buckets in the same well. It was noticed that no matter what happens, one was always sad, whining and looking morose and melancholic. It was always complaining about the situation of things all around. The other however, on the contrary, was always happy and motivated. No matter what happens, it was always in high spirits. Both buckets used to wonder what was happening to the other when they meet somewhere along the line in the well. The sad bucket was always wondering “why is this guy always happy? Are we not going through the same experience? Are we not faced with the same difficulties? The happy bucket on the other hand was always wondering aloud “what in the world is wrong with this guy? Why is he always looking morose and melancholic ? One day, they decided to talk and ask why the other was reacting differently in the same situation. The happy bucket asked first “why is it that you look sad and morose all the time? Is anything the matter? The sad bucket replied. “Everything is the matter! I am not happy here. Can you imagine, no matter how full I come up from this well, I always go down empty!! I am living an empty life!” “Waoh” replied the happy bucket. “Do you know what? This is the very same reason why I am always happy. No matter how empty I go down into this well, I always come up full!!!! I am living a fulfilling life! An attitude of gratitude will deliver you from worry. Be grateful for what you have and you will soon get what you want. Count your blessings, name them one by one. During your times of trouble, dwell on good things. Think about God's blessings - his provision and care.